First HSVMA Student Animal Welfare Symposium a Success! 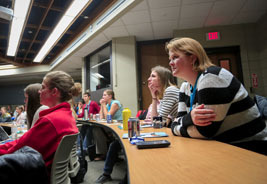 On November 7, approximately 100 students attended the HSVMA’s first Student Animal Welfare Symposium hosted by the HSVMA Student Chapter at the University of Wisconsin School of Veterinary Medicine. 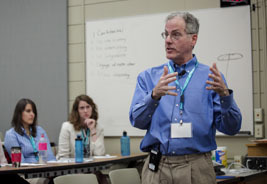 Animal welfare has become a hot topic in veterinary medicine and the HSVMA organized this symposium in response to the many veterinarians and students expressing interest in learning more about this emerging field. This premier conference for animal advocacy brought together future veterinary professionals for a shared goal: to improve the lives of all animals. Not only did participants gain a better understanding of the many issues that animals face in our society and ways to help, the symposium also served as a place to discuss some of the most complex and pressing animal protection questions facing veterinary professionals today. Veterinary students traveled from Indiana, Michigan, Iowa, Illinois, Massachusetts, Missouri, and California to join their peers in Wisconsin. Several veterinary technician students from Madison College attended as well. "I feel so privileged to have been able to attend the first ever Animal Welfare Symposium and to see veterinarians and students coming together to discuss the role of our profession in animal advocacy!" said Faye Lorenzsonn (class of 2017), HSVMA-RAVS Student Chapter President at the University of Wisconsin. "It was the first time that many of these subjects were openly addressed in my education, so I found it a very thought provoking and inspiring experience. I left feeling renewed enthusiasm and ready to take a more active role in animal welfare. Hopefully this conference becomes a yearly tradition so that other students can find the same support and motivation!" This year's conference featured a full day of important and timely animal welfare issues, including animal cruelty identification and reporting, commercial dog breeding operations, the impacts of cost of care on animal and veterinary well-being, extreme confinement of farm animals, and more. Veterinary presenters included Dr. Barry Kellogg, HSVMA Senior Veterinary Advisor, Dr. Barry Kipperman, HSVMA Board Member and California State Representative, and Dr. Susan Krebsbach, HSVMA Veterinary Advisor. For the panel discussion, students were able to ask any questions about animal welfare. To broaden the depth of experience, the presenters were joined by Dr. Lila Miller, Vice President of Veterinary Outreach for the American Society for the Prevention of Cruelty to Animals, Melissa Tedrowe, Wisconsin State Director for The Humane Society of the United States, and Akshay Verma (class of 2018), HSVMA Student Chapter President at Michigan State University. "The positive energy generated by the inspired students was so uplifting. Traveling to the symposium from across the country, these students voluntarily took time from their extremely busy schedules to educate themselves on animal welfare and some of the difficulties the veterinary profession must address," said Dr. Krebsbach. "It was an honor to be a part of an event with such unequivocal influence on the future of the veterinary profession." "It was inspiring to see so many future colleagues passionate about animal welfare,” said Western University veterinary student, Miranda Coats (class of 2018), who traveled from Pomona, Calif. Iowa State student, Laura Censi (class of 2019) agreed: "After attending this symposium, I would recommend that all veterinary students become actively engaged in the debates over current animal welfare issues to solve some of the most significant dilemmas within the veterinary profession." Due to the overwhelming positive response from student attendees, HSVMA intends for this to be the first of many Student Animal Welfare Symposiums, and looks forward to hosting a second event in the fall of 2016!